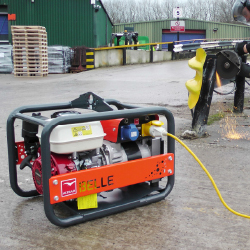 The GPX Range of petrol, open set Generators are built to provide reliable power in the harshest conditions. 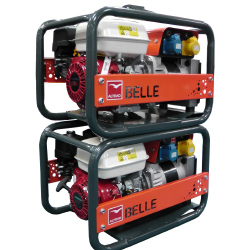 Engines and Alternators are protected from physical damage and the electrics have full overload protection. Ideal for rental and hire applications. Robust large diameter frame with built-in Engine / Alternator. Protection belly plate to aid use on soft ground (N/A to Wheeled version). Professional Honda engine with recoil start. High quality, heavy-duty NSM Alternator. 'Patent Pending' stackable frame with single point lifting to reduce enviromental impact and minimize manual handling risk. Complete with securing pin for added safety (N/A to Wheeled version). Engine / Alternator side impact protection. Rental-proof, robust, steel electrical enclosure. System breakers for 110v & 230v supplies. Wheeled version available ready for safe and easy transporation.